Market research companies infuriate me, more often than not their conclusions are glaringly wrong. For example, at least two ‘respected’ research firms predicted that Windows 7 would be the 2nd biggest smartphone platform in 2016. This conclusion, if you can call it that, was arrived at from the assumption that nearly all Nokia/Symbian customers would make the switch to Nokia’s new OS partner Microsoft without considering the alternatives. Optimistic is too kind a word, especially considering that Windows 7 continues to fail to gain traction and excite. 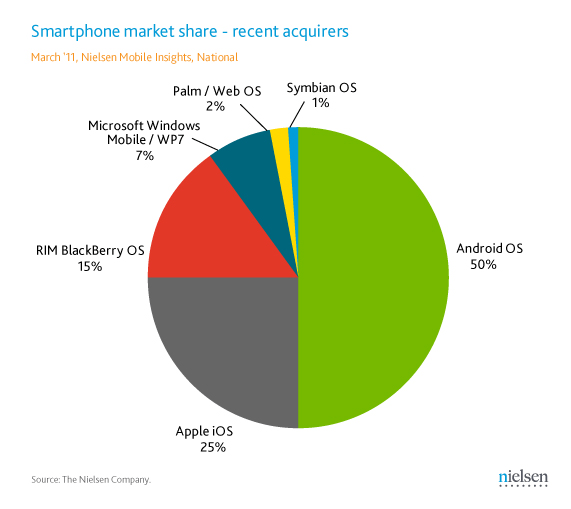 The other statistic which several research companies agreed on was that Android would have 45-47% market share by 2016. This could be on the conservative side as Nielsen reported yesterday that last month 50% of US customers looking to buy a smartphone wanted Android on it. Double the percentage for iOS/iPhone. Assuming Android’s momentum doesn’t immediately stop, it seems highly likely that Google can achieve over 50% market share by 2016 … perhaps as high as 60%, who knows. A lot depends on whether developers continue to flock to Android now they are the biggest smartphone platform, having the best choice of apps will be an advantage. Given the support of some major manufacturers Google can feel confident that the hardware running Android will be always at the cutting edge. A lot of Apple fans are confused why anyone would want an ‘inferior’ Android phone vs the massively successful iPhone 4. For me, the answer is simple … not everyone wants the same phone everyone else has. I don’t like buying cars my friends have, nor do I want the exact same phone everyone I know and see has. I’m an individual! Choice, in other words, is Android’s USP. You can have a large screen, a small screen, a fixed keyboard or a slide out keyboard. Every variation of smartphone format is now available with Android. The iPhone is sadly ‘one size fits all’ and that just doesn’t work for many people … especially those who have never heard of Steve Jobs (yes, they are out there)! Good point, or maybe a Palm Pre … don’t think I’ve ever seen one!